I’ll be appearing at Black Oak Books in the Berkeley gourmet ghetto on Saturday, December 6 2008 at 7PM. Please join me. Image shown in the poster: Spirals. Noted photographer and writer Harold Davis presents his work in an informal context. He’ll read from his books and show photographic prints, talk about photography and life, and answer questions. 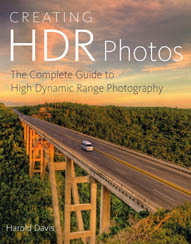 Harold Davis is a professional photographer and writer whose work has been widely published and collected. 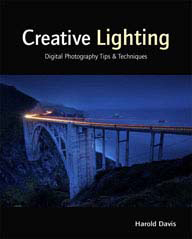 His most recent books are The Photographer’s Guide to Yosemite & the High Sierra (Countryman/WW Norton), Light & Exposure for Digital Photographers (O’Reilly Media), and 100 Views of the Golden Gate (Wilderness Press). 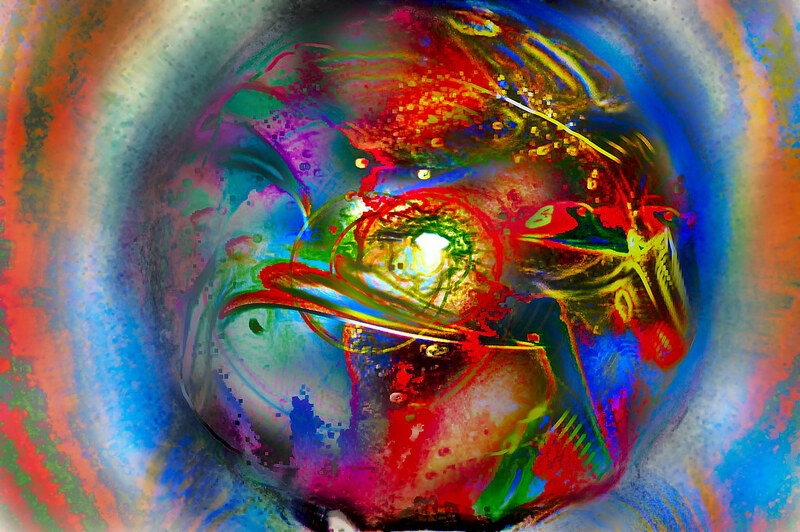 Harold’s current artistic interests include night photography, the use of color in composition, and creative post-processing of digital imagery. Magic Carpet Ride, photo by Harold Davis. View this image larger. 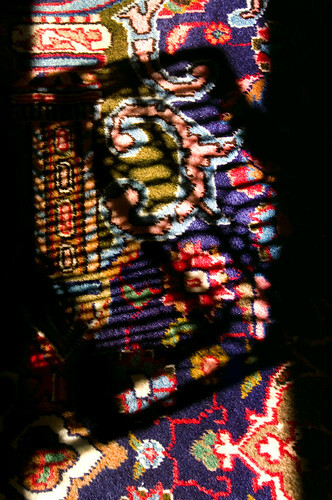 This is a variation on a theme via Photoshop, with the shadow of wicker on a Persian rug the starting place. Napping, photo by Harold Davis. We’ve had a great deal of excitement over Thanksgiving. My brother, sister-in-law, and nephew visited from Minnesota. We spent time at my parents house. Phyllis’s mom came in from Arizona and stayed with us. Phyllis’s brother and my nephew on his side visited us. Sometimes after all the socializing you just have to take a break. Katie Rose is shown above snoozing in Phyllis’s lap. 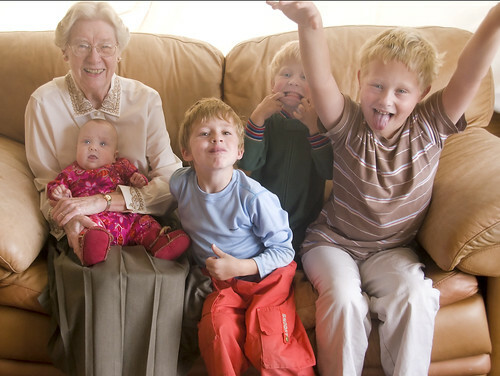 Below, the Davis boys are shown mugging for the camera with Katie Rose and Grandma Barbara. Thanksgiving Sunset, photo by Harold Davis. 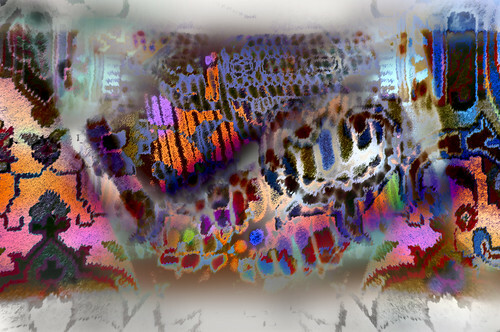 View this image larger. Thanksgiving in the Bay area was overcast and cloudy. Just before sunset there was a break in the clouds to the west, and I snapped this photo. Back by popular demand! Harold Davis presents his work and demystifies night photography. 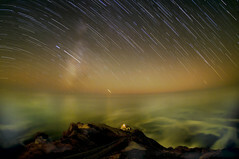 If you missed the last Harold Davis night photo webcast, here’s your chance. If you attended the last webcast, we’ve got new and improved audio, and here’s your chance to ask anything you’ve thought of since last time. Update: View the replay on YouTube. 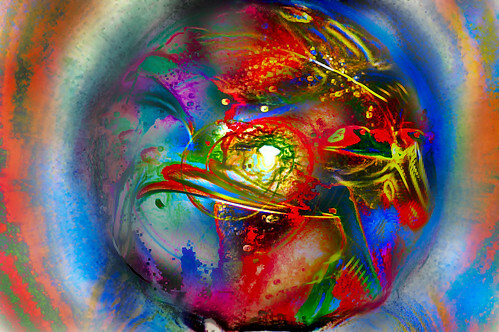 The original version of these images was a digital macro shot of a marble, digitally painted in Photoshop. At the request of a client, I prepared these variations. “Thanks for All the Fish” is, as you likely know, a reference to the inimitable Hitchhiker’s Guide to the Galaxy series by Douglas Adams. It’s the message the dolphins leave just before they abandon an about-to-be-destroyed earth. I used the reference because the modified marble reminded me of the earth in danger. 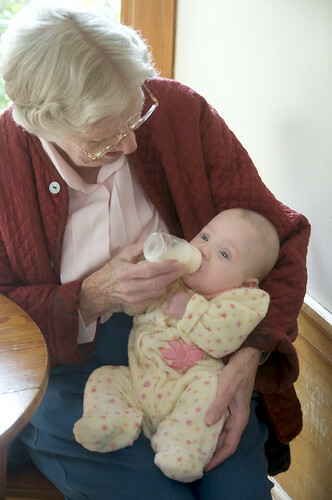 Grandma Feeding Katie Rose, photo by Harold Davis. Grandma Barbara has been staying with us this week. She’s shown here feeding Katie Rose a bottle. Katie Rose seems to recognize Barbara from her last visit, and is very content in her arms. From time to time I repost from my archives. This is a reposting of images and a story originally published in July 2006. The force that through the green fuse, photo by Harold Davis. View this photograph larger. I’ve seen many of your photographs and am really impressed with all the water drops. I’d like to know how you do it, and specifically what lens you use. There really is no one answer to this question. 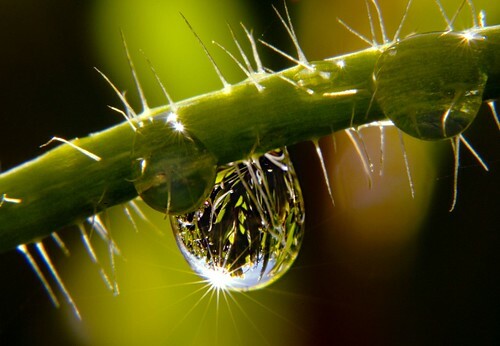 Water drop photography is macro photography with some subject-matter specific difficulties. Macro photography in and of itself is one of the most technically difficult kinds of photography because once you get really close to a small object inherently shallow depth-of-field, precise focus, and motion—even the slightest motion—are all issues that can defeat a photograph, no matter how beautiful it would be otherwise. What makes water drop photography a bit more difficult than run-of-the-mill photography of very small subjects is the extreme reflectivity of a water drop and the fact that a water drop is in almost constant motion (read more about these issues here). In this story, I’ll address the equipment I use—and tackle some of the other technical issues related to water drop photography in future stories. It’s also worth saying upfront that one can take perfectly good macro photographs with relatively primitive equipment provided the camera has a macro mode. For example, check out this photo of wedding rings that I took with a Canon Powershot G3. To get good results, you do need to be sure you are using a tripod, and know how to get the maximum depth-of-field from the camera. My macro lens are a Nikon 200mm f/4 (used with the photograph above), a Nikon 105mm f/2.8 (the older, non-VR model), and a Sigma 50mm f/2.8. I often use Kenko extension tubes (I have two sets) with these lenses. I prefer these to the Nikon extension tubes because they retain automatic exposure in Aperture-preferred mode. Besides the extension tubes, I have close-up filters for these lenses, a lens reversal mount for the 105mm lens, and a Nikon PK-6 bellows. I always focus macro lenses manually, and I use a magnifying eye piece for added precision. But most of the time I use one of my macro lenses, and these are invariably tripod shots, most often at the maximum possible depth-of-field, using mirror lock-up and the Nikon MC-36 remote to trigger the shutter. I think my tripod is probably my most important piece of equipment. It is likely to outlast my D200, and probably most of the lenses I currently use as well. My tripod is a carbon-fiber Gitzo MK-2, which combines light weight with strength and agility. To strobe or not to strobe, that is the question. Using flash as a light source with water drops replaces the natural light source with that created by the strobe (read more about this). When I do use flash with water drops, I use the Nikon wireless R1 close-up kit, which includes two Nikon wireless remote SB-R200 units. I also sometimes use a SU-800 unit connected via wireless to supply additional ambient light. My point being: that at its best, photography of water drops, like all good art, is about the creative life force, the urges that make us live, breath, yearn and die. A powerful force runs through each water drop, but all too soon (from the photographer’s viewpoint) each drop ends in falling or evaporation, with new worlds to live or die wherever one’s lens is pointed next. 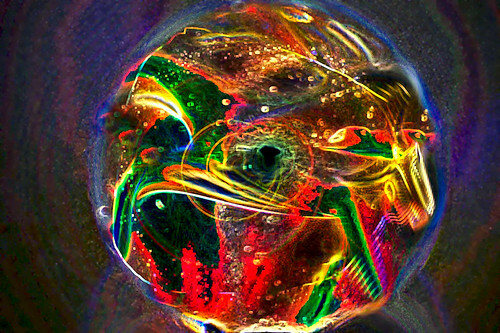 Water drop photography is about capturing the brief life of an ephemeral and tiny world. Bunny, photo by Harold Davis. 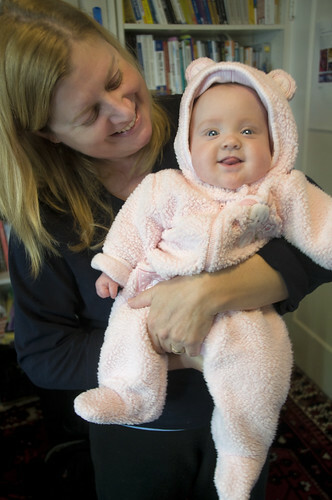 Katie Rose is a growing, plump, and happy bunny at over twelve pounds. She’s a cozy bundle to hold. This year the Thanksgiving turkey will likely be larger than Katie Rose, but not by much. 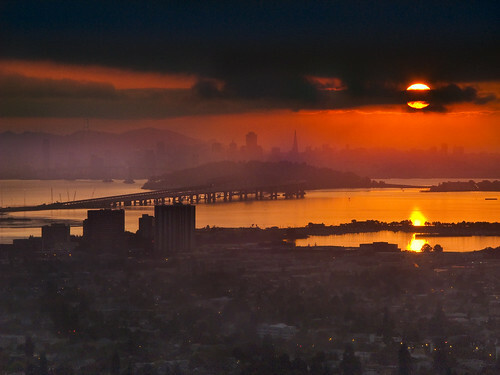 Fog on the Headlands, photo by Harold Davis. View this image larger. On a brilliant, sunny autumn afternoon Mark and I left the Tennessee Valley parking lot. Past the horse barns we climbed the Old Springs Trail to the Miwok Trail. We followed the Miwok Trail to the Wolf Ridge Trail, and then headed for the heights facing the ocean as the sun set into a fog bank. Two minutes later we were surrounded by fog as well. We made our way back down the trail in a thick fog and gathering dusk. 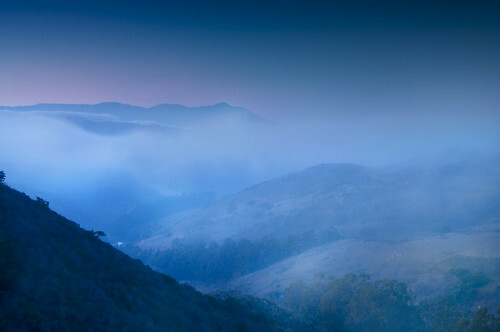 The fog opened once for a few seconds in the twilight to give this view of Mount Tamalpais across Tennessee Valley. Dreamweaver Rose, photo by Harold Davis. View this image larger. I was doing some yard work in our garden. It’s great to have rose blossoms in late November, and the complex curvilinear shapes of this Dreamweaver called out to me. 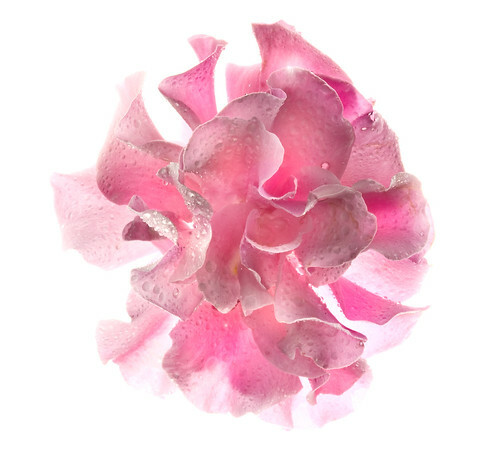 I snipped the flower, brought it inside, and photographed it straight down. I used a daylight balanced light box for the backlighting, and combined four exposures to extend the dynamic range of the composition. Related images: Dreamweaver Rose, my Flowers on White set on Flickr. Wicker, photo by Harold Davis. View this image larger. Briefly noted: Sunlight streaming through the bedroom window, the shadow of wicker on a Persian rug. To me, the effect looks like stained glass. Nicky on His Seventh Birthday, photo by Harold Davis. Nicky is seven, and it’s hard to understand where the time has gone. I remember him the day he was born, even then all mischief and sweetness and obvious intelligence. 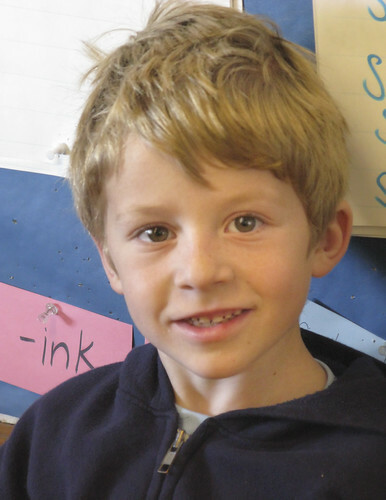 Nicky celebrated his birthday with his first-grade class (the photo above is in his classroom), in after-school, and (of course) with us and his grandparents. 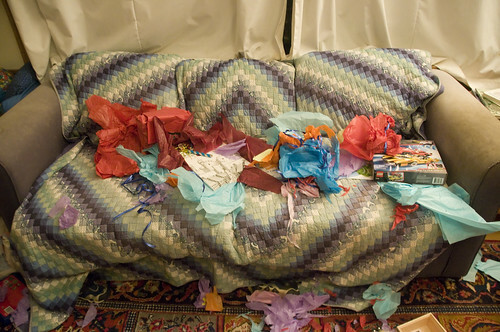 The photo below shows the aftermath of opening birthday and “unbirthday” presents. I don’t mean to give a false impression of extravagance with this photo. This year, like so many others, we are watching every penny. Each brother got a book, a lego toy, and a set of Kapla blocks. Once again, Phyllis made her famous castle cake (a/k/a Faulty Towers Cake). The boys sure enjoyed the presents, and the fierce rush of joy of present opening. Other Nicky photos: Nicky is 4; Nicky on Flickr. 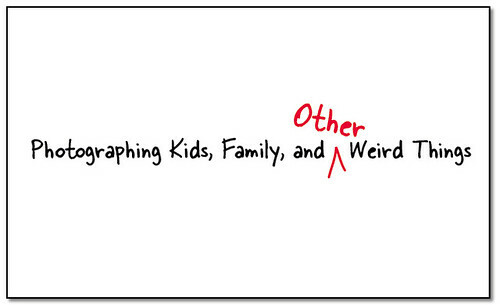 Kids, Family, and (other) Weird Things, photo by Harold Davis. This slide goes with a presentation, Less is More: Photographing Kids, Family, and Weird Things, I’ll be giving Monday, November 24, 2008 at the Golden Gate Computer Society, Embassy Suites Hotel, San Rafael, CA at 7:15PM; click here for more information. Don’t gain the world at the expense of your soul: personally engage. Using pre-visualization as a key photographic skill. Making the mundane fantastic—using composition to avoid boring family pictures. Leaving the shoe box behind…Displaying and preserving photos in the digital era. There will be time for Q&A. Bring questions with you! 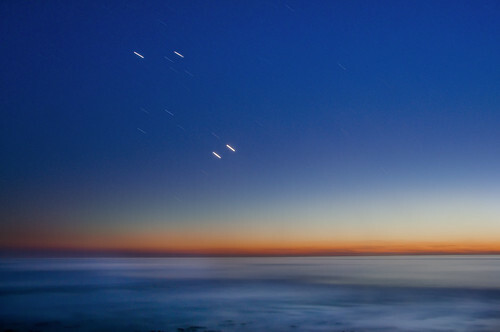 When Stars Wake, photo by Harold Davis. As twilight fades to true night the stars wake. First, a few stars start to appear as pin pricks of light on a somewhat luminous background. As dark blue begins to fade to the black of night, a five minute exposure like this one will make the stars manifest themselves, trails and all.